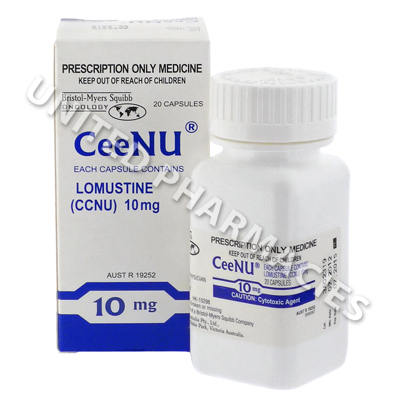 CeeNU (Lomustine) is prescribed for treating Hodgkin's lymphoma (also known as Hodgkin's disease). In addition to this, it is used to treat certain types of cancer or tumours affecting the brain, lung cancer and a type of skin cancer known as melanoma. CeeNU (Lomustine) is prescribed for treating Hodgkin's lymphoma (also known as Hodgkin's disease). In addition to this, it is used to treat certain types of cancer or tumours affecting the brain, lung cancer and a type of skin cancer known as melanoma. Apart from taking this drug, treatment for cancer may involve other drugs, surgery or radiotherapy. This drug is in a class of medications called alkylating agents, and it works by inhibiting or slowing down the ability of cancer cells to grow. CeeNU (Lomustine) capsules are taken orally. Some patients being treated with this drug will have to take a dose which consists of 2 (or sometimes more) different strength or colour capsules. The prescribing doctor may tell you to take it once every 6 weeks. In order to avoid nausea, it may be best to take this drug on an empty stomach. All patients should note that it is necessary to consult a doctor before commencing treatment with this drug, so that the correct dosage can be prescribed. Never exceed the dosage prescribed to you. It is necessary to inform your doctor if any side effects occur, especially if they become serious or persistent. There is also the risk of serious and potentially harmful side effects occurring when this drug is taken. You must immediately consult your doctor if you notice breathlessness, changes in mood, swelling of the limbs, changes in urination, fever or any other symptoms not listed here. If you suffer from anaemia, a blood clotting problem, kidney disease, lung disease or liver disease, it is necessary to tell your doctor before taking this medication. This drug may harm an unborn baby. Female patients should use contraception while undergoing treatment with this drug. Always use CeeNU (Lomustine) as you have been prescribed by your doctor. Never self-medicate or change your dosage without first consulting your doctor. The correct dosage can vary depending on your health, medical history, and the severity of the condition being treated.